Pre-assembled model kit of Chris Evan's Captain America from Marvel's Avengers Age of Ultron! Assembled in seconds - no glue or paint required. Whether you've been reading the comic books for decades or just really enjoy Marvel's Avengers franchise, this is the model kit for you! Cap is wearing a movie-accurate version of his iconic suit, with his trusty shield, and displayed on a diorama base. 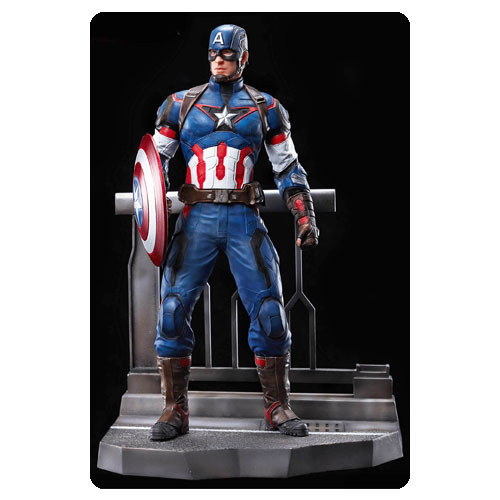 The Avengers Age of Ultron Captain America Action Hero Vignette 1:9 Scale Pre-Assembled Model Kit comes pre-painted so with just the snap of a few parts, you can have a highly detailed desktop display of your favorite Avenger! Stands approximately 7-inches tall. Ages 14 and up.